Nike asked in multi-page print ads while stressing on equality. Nike made the former San Francisco 49ers quarterback Colin Kaepernick one of the faces of its 30th anniversary “Just Do It” ad campaign. 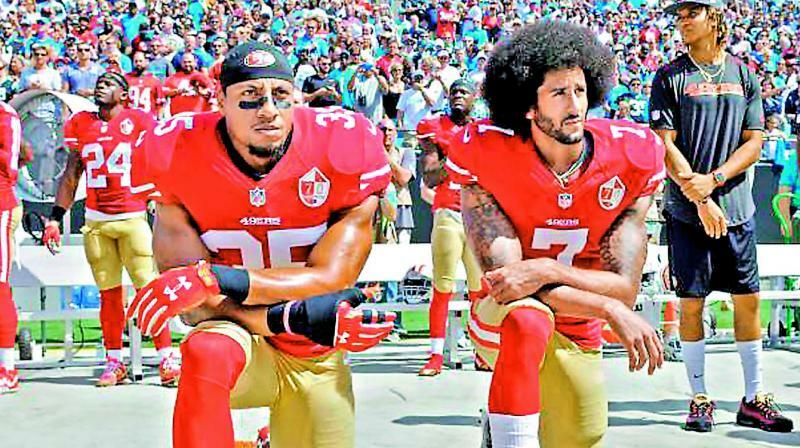 The most talked about ad — featuring the American gridiron football player who started the movement of NFL players kneeling during the national anthem to raise awareness about police brutality on African-Americans and other such racial injustices — has split USA further down the middle. President Donald trump, a vocal critic of athletes who knelt, had said that those who took the knee should be fired, also adding that players who don’t stand “shouldn’t be in the country”. The ad may have polarised USA even more and not only across the Republican-Democrat divide but also made it an open war between white and black. In a plunging stock price backlash, the company lost $3 billion market cap but may have made friends of people who saw it as a fitting comment on the state of USA and the battle of the races. Of course, with less than 50 per cent of its global sales coming from the US, Nike may benefit worldwide with its message about equality and opportunity while putting the spotlight on US discrimination. “Is this the land history promised?” Nike asked in multi-page print ads while stressing on equality. The image of sport and how it offers a level playing field for all received a boost even if the Republicans and others started burning all their sporting apparel and shoes with the famous Swoosh. Remember when Colin Kaepernick wore socks that depicted police officers as pigs? So here’ s my question for Nike: if Mr. Kaepernick wore socks mocking Muslims or gays, would you hire him to endorse your products? Is this a joke Nike? 1. Colin Kapernick didn’t even believe in “the something” enough to vote in 2016. 2. What is the sacrifice? He has not sacrificed anything! Nike pays workers in Thailand next to nothing to produce sneakers that they then sell for $125 a pair. Nobody cares. Nike pays Colin Kapernick & puts him in an ad, everyone loses their minds. 1. Racial injustice is real. 2. Colin Kapernick has chosen to take a stand for his beliefs.